How to Backup Android Data last updated on 18-Jan-2014. Data backup should be a regular schedule for those who work more on their Smartphone or tablet, specially those who love to experiment new features and unknown system settings. Our Smartphone and tablets are no more ordinary gadget that help us to make and receive calls, send text messages, but do a broad number of tasks as the modern computer do. With Android, Smartphone and tablets are getting more popular. We store important data securely on phone to use on the go, we stores reminders for important dates and events, phone store daily work schedule along with many other important task, such as- stores contacts, Messages, WiFi Settings, APN Settings, Passwords, downloaded apps, games etc. All these are very important to us and this backup guide will help to safe guard all data so that we can restore later when we need. You should always do a schedule backup as you never know when your phone will stop working. A small unknown setting may harm your device. It may happen that you install an unknown app and after that your phone started hang and got stuck in bootloop. If so, then you have to do complete wipe to fix bootloop and that will erase all your contacts, messages, apps and settings. So, always backup your android phone before making any changes. In this article, we going to share some of the great free backup apps for both rooted and un-rooted android device. Most Android Devices comes with basic data backup feature which able to backup contacts, WiFi Settings, Passwords etc but can’t backup SMS, MMS and other important data. If you are a frequent custom ROM flasher then you can easily do a nandroid backup with CWM or TWRP Recovery which backup almost everything. Google Play Store has full of free apps through which you can backup everything stores in your Android phone. Below you’ll find android backup apps for rooted and non-rooted android devices. Here we have listed some of the best free backup apps for both rooted and non-rooted android device which backup all your contacts, messages, logs, apps and settings and restore them later when you need them. Check all of them. Backup Your Mobile is an all in one free data backup & restore app. 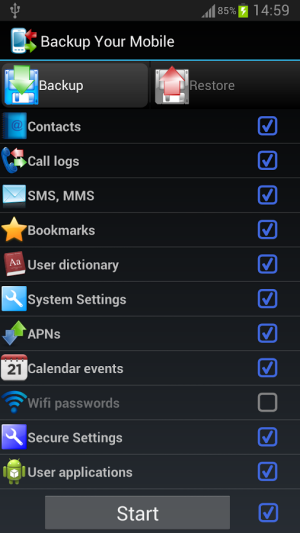 The application does a number of backups and restore task for your android device which includes- backup Contacts, Messages (both SMS and MMS), call logs, System Settings, WiFi Passwords and settings, APN’s, Bookmarks and browser history, Users Dictionary, Calendar events, apps and others. You can store backup file on SD card or in device memory. You can also store data to Google Drive or Dropbox with the help of this app. The app offer you to backup selected item manually or schedule an automatic backup. 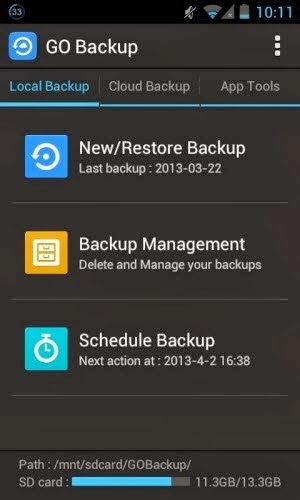 Like the previous one, Easy Backup is also an all in one type backup application for all android device users. With the help of this app, Easily backup and restore all your SMS, MMS, Contacts, Call Logs, Calendar, Dictionary, Bookmarks, Apps and store backup file to SD card and also the application allow you to store backup online to your Gmail Account, Dropbox and Google Drive Account. You can schedule an automatic backup or do a manual backup. The app also allow you to view backup content and you can Email backup content if needed. The GO Backup & Restore Pro is stable, easy and professional data backup app for android Smartphone and tablet devices. This is a pro version app and can be free to use to backup and restore important phone data such as Contacts, Call Logs, Calendar records, Bookmarks etc, system settings, apk file, app data and more. This free version has some limitation than the paid one, you can only store backup file to SD card and not to your online account like Dropbox or Google Drive. Schedule automatic backup option is also not available with this free version. JS Backup is another great all in one data backup app which allow you to easily Backup and restore your Contacts, SMS, MMS, Call History, System Settings, Apps, Calendars, Bookmarks, Dictionaries, Alarms, Shortcuts, Images, Videos, Music, Playlists and more. The JS Backup application not allow you to backup data to SD card but also you can store backup file to cloud based storage such as Dropbox, Google Drive and SugarSync. One of the important feature of JS Backup app is that, the created backup file saved in CSV format, which allow you to view the backup content using Excel and other supported applications. One more notable feature is that you can track your backup history online through the developers backup history server. 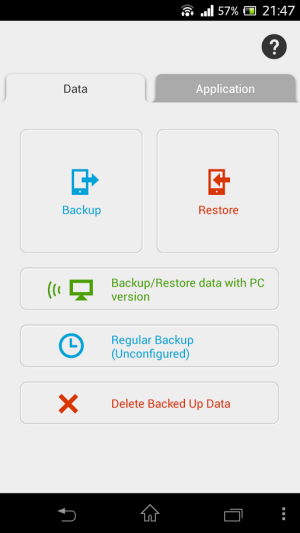 App Backup & Restore is a great free application to backup installed app on your android Smartphone and tablet devices. You can backup all third party apps installed on your android device with the help of this free application. The app can be used with both rooted and non-rooted android devices. However, when used with non rooted android device, it can’t backup the app data, you can only backup the .apk files. The app can store backup file to phone SD card. The app can also backup system apps after enable the option from the app setting. You can create backup manually or schedule automatic backup from the app setting. Titanium Backup is most talked and most powerful android data backup application. The app is capable enough to Backup and Restore and Freeze (option available with pro version) android apps, data and market links. The backup includes all protected apps along with system apps and data stored in external SD card. You can do manual backup, batch backup or schedule automatic backup. With pro version backup process runs without closing any app. With the help of this app you can transfer app or app data to or from SD card. App Extractor is actually a data restore app which allow you to restore personal apps, data, SMS, MMS and Messages from ROM Manager backups. The App Extractor is compatible with ClockWorkMod Recovery 5 (CWM Recovery) backup file and also compatible with previous version of CWM Recovery backup file. 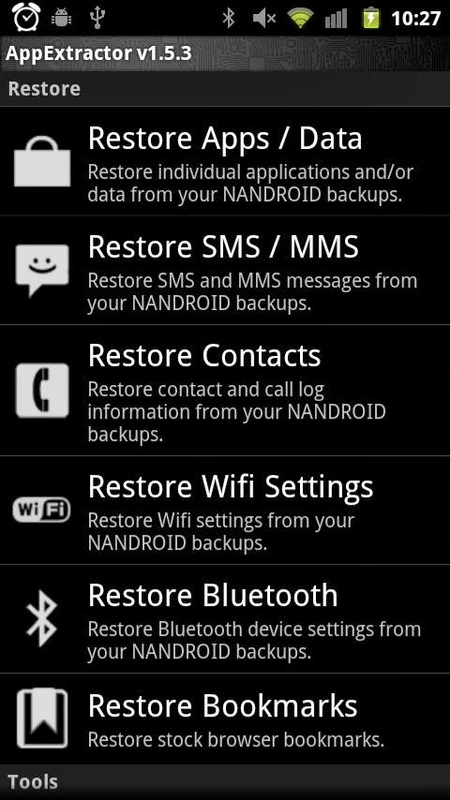 As we mentioned above, the App Backup & Restore is a great app for both rooted and non-rooted android devices. With rooted device, you have more option to properly utilize this app to backup all your installed Apps data along with apk file. Download the app from the above link. Hope all the above listed apps (both for rooted and non-rooted) will help you to backup your valuable data and personal settings so that you never loss anything that store in your android device. There are many other great apps available in Google Play Store for free but we found these as the best for your rooted and non-rooted android devices. 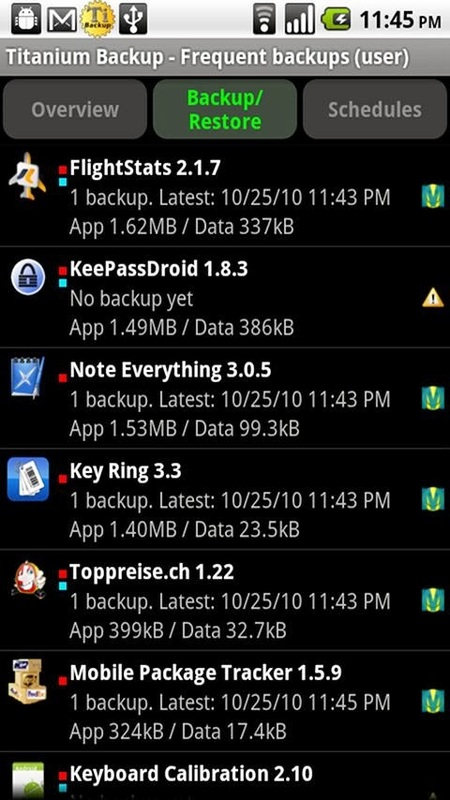 If you know about any better android app for backup, do share with us in the comment.